Comments: 6G5:Tremolo: 2 x 7025 (harmonic vibrato) 6G5-A: Tremolo: 7025, 12AX7 and Â½ 12AX7 (harmonic vibrato) The 6G5-A Pro left Â½ a 12AX7 unused. It’s possible that there were a few production Pros covered in the rough blonde Tolex. I own one of these that I bought from S.I.R. Los Angeles back in about 1979. The manager at the time showed me the rental logs for the amp and EVERYONE had rented it at one point, including Beck, Bo Diddley, Muddy Waters, etc. Pretty much everyone except for Clapton and Page. I’m not even a guitar player (I’m a reformed drummer) but I had to have it – right then, that day. It matches up nicely with the Jazzmaster that The Ventures gave me the day I left the band after two years as FOH/Road Manager. That particular Jazzmaster is the guitar they recorded “Walk Don’t Run ’64” with. What a great story. Cherish that gear. They must have really appreciated you’re loyalty. I bought a 62 brown Pro a couple of years ago on ebay and it is near mint. Just the filter caps were replaced. I did some upgrading on them. They were cheap Chinese caps and didn’t do a good job of filtering and they were new. I put in some Sprague Atoms beefing up the mains to 100 uf and it just roars. I took out the Oxford 15M and set it aside. Wasn’t a great sound but held up to the 40+ watts alright. I wanted a big beefier sound with a high decibel(SPL) rating. Not a lot of choices but Eminence has a few. 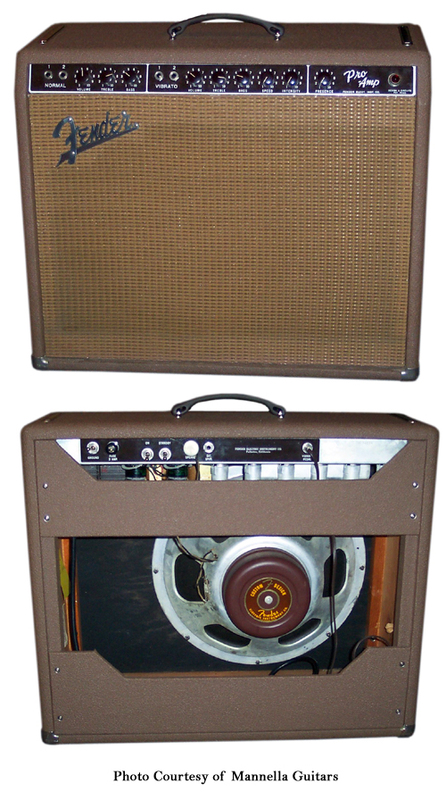 The 150 watt Legend and a 75 watt version they used in the Vibroverb reissues. The 75 sounds a little better.Eminence also makes the Big Ben in the Patriot series with a british tone and can handle 225 watts.It also sounds nice. All three speakers have over 101db rating and are frickin loud! I also run it through a 2-12 Marshall cab with the G12H-30 pulsonic cone Celestion greenback speakers. Now were talking tone. I have a picture of Chuck Berry in the early sixties playing his Gibson ES-350 and behind him is a 62 Fender Pro with the wheat grill and doing his “duck walk”.He’s plugged straight in to the amp and sounding great I’ll bet.My amp looks just like it.Hung it in my guitar room.It sounds great with my Strat but just sounds pissed off with my Paul Reed Smith and its hot humbuckers…Mark K.
I have a transition model ’63. Tube chart says LC, but it is a brown face, flat logo on a silver grill cloth and black tolex. Came with a JBL D130-f. I visited a steel players site and they subject of the transition models came up. Seems it was a limited run, or until Leo used up the old stock. Great chimey sound and tremolo. I used a 65 Fender Reverb unit with it. Killer tone with my Telecaster. I traded for it to use with a Vox Continental but Dual Showman sounds better with the keys. Anyone else heard of the transition model ’63? I stand corrected! After disassembling the amp, I found a few hidden clues that this was a pretty good retolex, but not one of the transition models. I have since shipped the cab to MOJOTONE for a complete rehab of the cab and tolex and grillcloth like what came on the amp. The JBL checked out at the speaker shop, and the amp will undergo a complete check to make sure there are no issues with authenticity. Mojotone has shipped the cab. My tech has gone over the amp. She’s all original, except the power transformer, which is a ’65. I’m currently looking for an early 62 or mid to late 61. Rough brown tolex with Oxblood grillcloth with gold weave. Too cool! When I was in high school in 1973 I acquired a brown Fender Pro in a trade, identical to the one pictured. In my ignorance I traded it away for god knows what POS. At the time the browns were considered just used amps and certainly not yet vintage, collectible or even desirable. Heck they didn’t even have reverb! Everyone wanted Marshalls or at least a modern Fender black or silver face. I weep to think of the one that got away, especially when I see them selling for $2500+. I just inherited one of these from my high school guitar player (’68-’69) I have no idea when and where he bought it, and it isn’t in any picture he ever sent me of his music room. It has a lower serial number than any example I have ever seen for sale. It is not in the greatest shape cosmetically, but it has a repair invoice taped to the back of the speaker, a three prong plug, and new Groovetubes, so someone at least looked at it. It sounds AMAZING, particularly the harmonic tremelo. I plugged in a guitar and hit a single low G note, and my wife screamed, “Twin Peaks!” I am wondering if having it fixed up by someone like Mojotone is recommended, or if I should leave it original. Also, where can I find a serial number reference? My Pro says 6G5 on the tube chart, but has the knobs where you say they should be on a 6G5A. It also has an external speaker jack, which you list as an A model. The tube chart is missing the upper right hand corner, and hence the production date, but I found a serial number chart that puts it around mid-61.